As we have a swimming pool and a lake on the family property upstate NY it was a priority for my husband and I to start our Son Swimming lessons as soon as possible. I knew about the Williamsburg/Greenpoint located Aqua Beba Swim School and wanted to check out their vibe and do a drop-in lesson before we committed. Fair enough I thought? However, when I first called to inquire it was politely explained to me that it was a matter of privacy towards the participating families and as each group progressed together it was not fair to bring in curious-not-sure parents to observe a class. Well, the way it was explained left me no choice and on Word-Of-Mouth recommendations I agreed to sign Miles Storm up for his first semester of lessons. And, I am happy to write that we were so not disappointed. I took our 20-month-old Son 2 weeks ago to his first lesson and by the end of it he was jumping from the side of the pool into my arms (in the pool) and Kick-Kicking his way across to the other side (with me holding him). But wait, by his second lesson (as the photo below shows) he is comfortably being submersioned and swimming under water without a worry in the world. This is a true story and not a word of a lie! I am just so upset I only found about the classes now, as Aqua Beba starts infants as young as 4 months of age in the water. Aqua Beba is the brainchild of Serbian born Danilo Krvavac and his wife Heidi. Danilo is kind of like a Swim God as Cesar Milan is to Dog Whispering (in my opinion). He has a gift, and people in the neighborhood rave about him. Heidi told me that when she met Danilo she could barely swim having been intimidated, since she was little, about being in the water. One day Danilo took her to the pool and taught her to swim in 15 minutes. That is amazing! When their first daughter, Penelope, was born Danilo had her in the water as soon as possible thus realizing that there were no heated pools in the area to swim with her in, and that there appeared to be a need for an infant swim school. Presto thankfully Aqua Beba was born! In her own words – Danilo worked with children in Europe in the past and wanted to develop a unique program that really catered to every child’s need. He has blended so many techniques and styles to make it his own. If a child is nervous or afraid to go in the water we never force them. We work with them at their own pace until they are comfortable. The reason we ask parents to come in the water is so that each child is swimming the entire class verses sitting on the side of the pool while an instructor works with one child at a time. Also we realized that we will not be with you on vacations so parents needed to be involved. We try and keep it fun but we are really more targeted towards getting everyone swimming and safe in the water. I highly recommend to local parents in the “Willy B” Brooklyn area to sign your Little One up with Aqua Beba. Classes are very small (maximum 8 students), with 2 teachers in the pool. Semesters do fill up fast though, so get on to it now for the summer session. Cost is about $200 for five 45-minute lessons. Also, if you want to check out photos and join the growing group of Aqua Beba Fans you can like their FB page – HERE. Miles Storm’s 2nd Aqua Beba Lesson – casually swimming under water. No Worries at All! 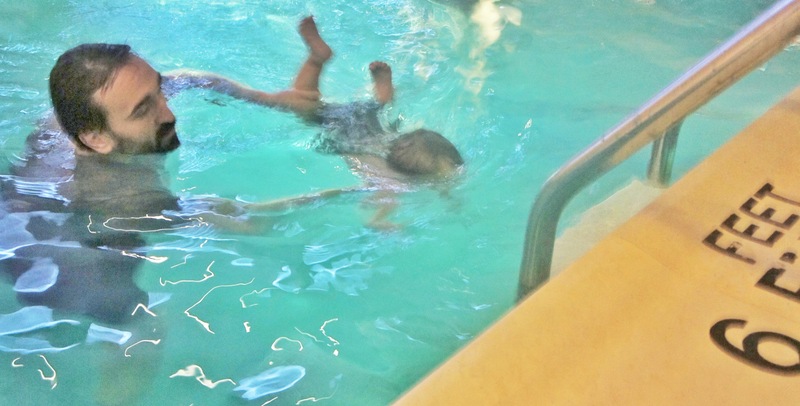 This entry was posted in Williamsburg NY and tagged Aqua Beba, Baby Swim Lessons, Brooklyn, East Williamsburg, New York City Kids, Toddler Swim Lessons, Williamsburg Brooklyn, Willy B Mum on June 9, 2012 by WillyBMum2014.